Over at Splitcoast today, we’re showing Versamark a little love! LOL! Versamark is such a fabulous tool, you can emboss with it, use it as a watermark, and use with with chalks…just to mention a few ideas. I had a little trouble photographing this today as I wanted you to see the sparkle but without the glare! I used a 6 1/2″ x 5″ card base today and then stamped it with Versamark and heat set it to produce a watermark. 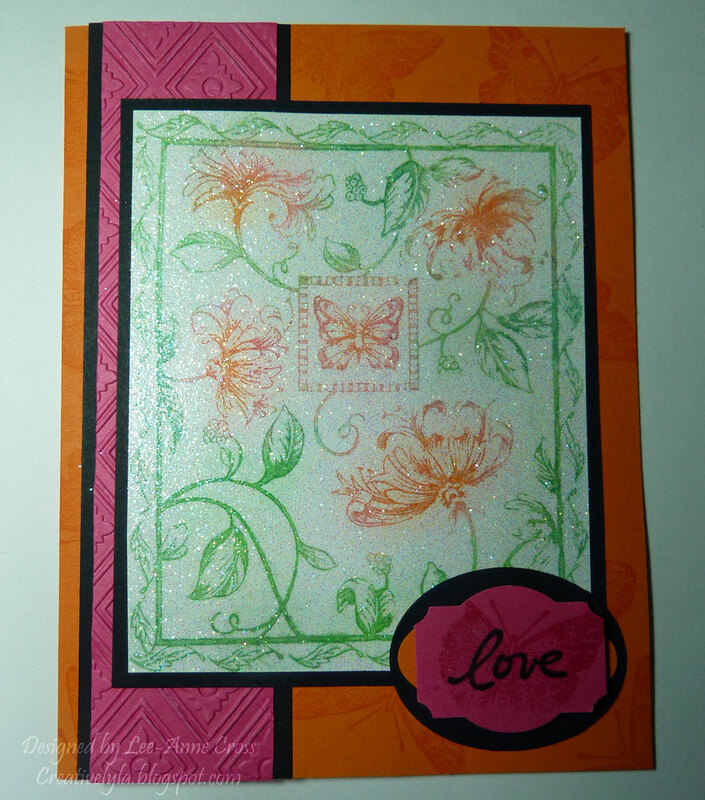 Next I layered a dry embossed piece of pink card stock over some black. To make the focal image, first I stamped the large image with Versamark. Especially when stamping a large image, but also useful in smaller images too, I always flip the stamp on it’s back and take the ink pad to the stamp. It’s so much easier to see where you’ve inked and to get good overall coverage. Once it was heat set, I colored it with chalks in pinks, oranges and greens. The I covered the entire piece with Versamark once again and heat embossed it with Irridescent Ice. The sentiment is a large oval in black and a smaller oval that’s been cut in half and pulled out to the edges of the larger oval. The label punch as been stamped in Versamark, heat embossed in black and then overstamped with Versamark yet again. My final step was to again heat emboss with Irridescent Ice. So, I’m thinking I gave a lot of love to my Versamark pad today…don’t you? If you haven’t worked with one – try it…it’s a lot of fun! Ink: well what else but VERSAMARK! LOL!